In an industry that is often filled with fads and trends, it's rare to find an artist that achieves longevity while maintaining relevant to the ever changing music community. Enter Cheryl "Coko" Clemons, who has had an undeniable impact on urban music over the last two decades. From her chart-topping recordings with the group SWV (Sisters With Voices) to her two solo albums, Coko's unmistakable voice has defined a generation. In 2006, she released her first gospel effort titled Grateful, beginning yet another chapter in her storied career. The Brooklyn, NY native received critical acclaim for that effort, resulting in nominations for Grammy, Dove, and Stellar awards. Now, the accomplished artist returns with her sophomore gospel album and third solo effort titled The Winner In Me, which is set to make another huge splash. GOSPELflava.com had the opportunity to sit down with the vocalist to talk about her career and the process of making this new album. For most, there is an array of challenges in moving from the freshman to sophomore effort. However, this process was not nearly as arduous. "Studio is not one of my favorite things to do," she admits. "When I'm recording though, it seems like the right songs happen to come to me. Everything just seems to fall into place on its own. It sounds crazy but it happens like that each and every time. It happened with Grateful and it happened with this one." While Coko is no novice to the church world, transitioning from the secular to gospel arena has required a series of adjustments and caused for several lessons learned. "I learned that I have to get over people and I have to do what I know God has called me to do," acknowledges Coko. "It took me a minute. My feelings got hurt a little but I'm over the people right now. If you like me, you like me. If you don't, you don't. I'm still here. " "You expect haters on the secular side but I didn't expect that on this side, honestly," continues Coko. "When I did come over here and I did experience that, I was like 'Wow'. Once I felt it, I began to see how I needed to handle things." Fortunately, the soprano vocalist was not deterred by some of the opposition she initially encountered. She credits her fans for encouraging her to continue moving forward. "Every time I get an email from someone that says 'Your ministry has really blessed me' or 'I didn't listen to gospel music until you did this record', it inspires me to keep pushing forward," says the Virginia resident. "I've heard many different testimonies from people that were blessed from Grateful made me want to keep going. There's always going to be haters no matter what you do. I'm not going to allow the haters to control my destiny and what I'm supposed to do. Someone out there is being touched out there by what I'm doing. I just want to continue to put out positive music and touching those that want to hear from me." Most are familiar with the artist as the lead singer of the popular R&B group SWV. The group was a dominant part of the urban music culture for most of the '90s, producing four albums and a bevy of hits including "Weak", "I'm So Into You", and "Rain". As her gospel career has launched, she continues to maintain a connection with her "sisters". "Teddy Riley was doing something and he wanted us to reunite for the performance," shares Coko. " We hadn't talked in years. Then we talked and tried to work through some things. It took a minute but we eventually worked through it. They knew that I was back in church. I explained to them that we could sing together but there were some songs that we'd have to take out and they were cool with it. They were cool with everything that I was and was not willing to do. Everything just fell into place." "Right now, we're closer than we've been in years. It's a really good feeling," continues Coko. " We did the BET Awards with Alicia Keys and that helped to bring us together even more. We still perform. We do shows together now. They are getting into church now. Lelee's our preacher!! I'm excited about our future as a group and what we're gonna do. I'm married and Taj is married now. Only positive things are coming from us." Coko's vocal work and urban flair laid the groundwork for the girl groups and urban leads from Destiny's Child to Keri Hilson. Speaking of Hilson, she is one of a long list of admirers of Coko's vocal ability. Coko is surprised at the outpouring of love from new urban artists. "That's so weird to me because I didn't think about that," says Coko surprisingly. "I got a phone call and they said 'did you know that Keri Hilson pays homage to SWV on her shows?'. I was totally surprised. She found out that I lived in Virginia and she asked me to come out and perform 'Weak' with her. I thought it was really cool. To see things like that makes me feel really good and appreciated. I thought SWV was a good group but I guess now I'm just starting to really see how many people we did influence. It feels good." There has been great anticipation for The Winner In Me, Coko's follow-up to her wildly successful gospel debut, Grateful. "The first song that I remember hearing was 'Rescue Me' and I fell in love with it the first time I heard it," shares the Grammy-nominated vocalist. " The song ministered to me and I knew I needed that song in my life. 'Made a Way' was different for me. I don't think people were expecting me to mix praise and worship with a little bit of hip-hop. I wanted to do something different but I wanted it to be a great message as well. I was comfortable moving in different directions. I'm always willing to try new things." One of the many memorable moments on this album is Coko's duet with Kelly Price on the song "Oh Mary". The connection was a rather simple one that dates back quite some time. "I've known Kelly for SO long," says Coko. "I used to go to her husband's uncle's church when I was a kid. We'd see each other in church and have known each other for a while. I did 'Endow Me' with Faith (Evans), Fantasia, and Lil' Mo and Kelly wasn't on that one. So I felt that the next best thing was to do something special with Kelly. We were just looking for the right song. So Shep (Crawford) gave me 'Oh Mary'. When I was listening to it, I told him that it sounded like it was a duet and he replied, 'It is!!' We both immediately thought about Kelly. She was totally on board. We went in and cut it and it was like magic!!" Amid the twelve gems on this new effort, it might be challenging to identify a favorite track. Don't feel bad. Even Coko couldn't quite narrow it down to just one song. "I actually have two favorites on the album," laughs Coko. "They are 'The Winner In Me' and 'May Be The Last Time'. 'The Winner In Me' was written by my pastor for his wife but he wanted my mom to sing it. She brought the song home to learn it. While listening to it in the house, everyone is responding to the song and I asked 'What song is that?' She told me, 'It's the song that Pastor wrote.' We played the song for my husband and he fell in love with it. So I knew I needed this song. When I asked my pastor for the song, he looked at me like I was crazy. He told me that God told his wife that this song was for me and I was to record this song. So he was amazed when I came and asked him for the song. I LOVE this song. It speaks volumes to me. I am glad that he allowed me to record it." "'May Be The Last Time' is a song that we actually sing in church every Sunday for praise and worship," continues the skilled soprano. "My pastor wrote that song as well. Every time we sing it, the church rocks out. So I knew I wanted this song as well." The Virginia resident has a fantastic relationship with her pastor, Pastor Kerry Smith. Having penned her favorite songs on this effort, he holds a special place in her heart. "My pastor is so talented," shares Coko. " He is a part of the group The Virginia Aires. He plays both keyboard and bass. He is really musical. When we were in the studio, he was there giving out intricate parts. He sings background on the album. He's very talented. He's not one of those pastors that runs to his office when church is over. He stands around and talks to the people. He's a fantastic guy." Of the many talented producers that are featured on the album, one producer shares a special relationship with the lead singer of SWV. That producer is 'Big' Mike Clemons who is not only an accomplished drummer who has worked with the likes of Israel & New Breed but also is Coko's husband. Sharing the role of husband and producer took some adjusting for Coko. "Sometimes, we're cool. Then there are other days where I tell him 'Don't tell me what to do," Coko says jokingly. "When we first started working together, it was not good. It was terrible. I had to really learn how to separate my husband from my producer. At first, I wouldn't want to sing parts over and the like. But now, when we're working, he's not Mike my husband, he's Mike my producer. It's a LOT better now. It's easier for him." While Coko has an established catalogue of successful music, one of the tenets and secrets to her enduring success has been her relationships with her followers. In the modern age of social networking, Coko remains one of the industry's most accessible personalities. "The fans like to talk to so-called 'celebrities'," shares Coko. "It means so much to them when they say "hello" to you and you respond to them. I don't see anything wrong with saying "Hello" to them. These are the people that buy my records and support me. Because of them, I am who I am. I like to talk to them and tell them what I'm up to. Some of them I talk to so regularly, that I feel like I actually know these people. It doesn't hurt to be nice. They are nice enough to support me. I can be nice enough to talk to them and hold conversation. That's why I'm on Twitter, Facebook, and Myspace. I'm all over the place just networking and talking." Blending transparency and accessibility with skill and excellence, Coko has established a following that crosses genres, denominations, and ethnicities. With a career spanning close to two decades, she remains one of the industry's most enduring voices and sought after personalities. 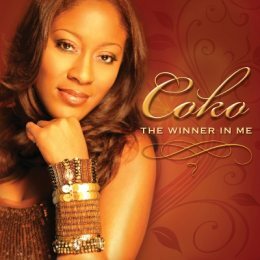 Coko is positioned for the next chapter in her storied career which is sure to highlight the "Winner" in her.